Chakra are subtle energy centres located within and beyond the body, and have their origins in Indian religions, namely Hinduism, Buddhism and Jainism. Generally there are thought to be seven main chakras, from the Muladhara or Root Chakra located at the base of the spine to the Sahasrara or Thousand-petalled Crown Chakra located on the top of and above the head. The chakras are part of the 'subtle' body, a generally invisible counterpart to our physical body that can be energised and awakened during meditation, yoga or spiritual practice. Mantras (repeated vocal sounds), symbols and mandalas correspond to specific chakras and can be used to open or meditate on them. 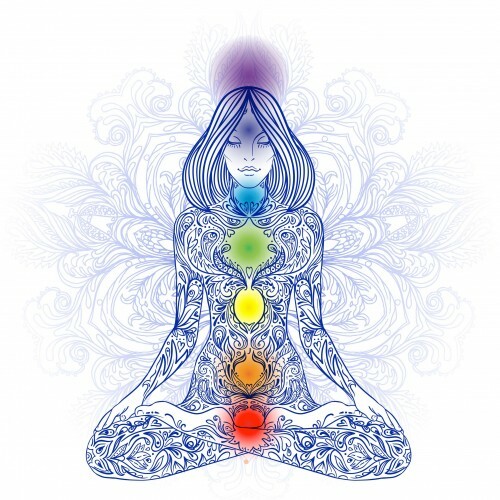 Kundalini yoga in particular focuses on spiritual awakening through stimulating the upward movement of energy through the chakras and out via the Crown to the Universe.